What Are Avseals, and How Can They Benefit Your Applications? 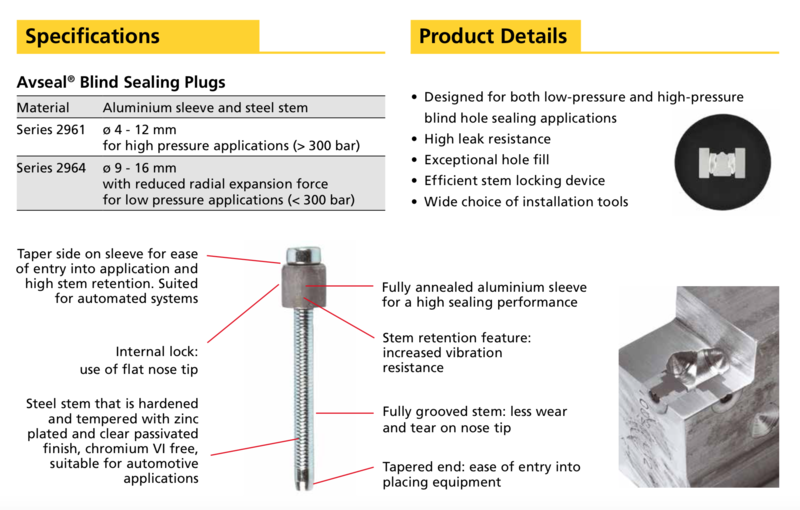 For some applications, a tight seal plugging a hole isn’t a luxury—it’s mandatory. 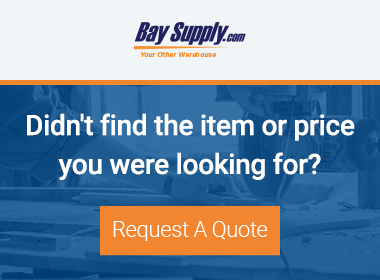 Leaks of air or fluid are simply not acceptable, and you must have confidence that the seal you supply will perform as expected, even if you don’t have access to one side of the hole during installation. The solution to this scenario might be an Avseal. Produced by Avdel, an Avseal is a two-piece blind sealing plug that fills holes in thin metal components in low- and high-pressure applications. The technology has advanced to the second generation, and the Avseal II is even more effective with poorly prepared and oversized holes. Cross drilling in castings present a unique challenge in effectively sealing the hole. Threading a plug into the hole, welding the hole, press-fitting it with pins, or filling it with steel balls are measures that can be taken to seal the hole, but none of these processes is reliable, and all require extra time and expense to complete, thus slowing down assembly. Avseals were created to deliver a high-performing, pressure-tight (up to 500 bar) seal that could be applied efficiently and expediently. The two-piece (steel mandrel and aluminum sleeve) plug is placed onto a rivet gun and into the blind hole. Upon pulling the trigger, the sleeve is compressed and expands to form the seal. The pintail breaks away and leaves the plug even with the assembly’s surface—and sealed tight. The process is efficient because it doesn’t require any preparation of the hole (e.g., thread tapping). Moreover, Avseals can be applied with a standard Avdel rivet gun—there’s no need to purchase or train on extra equipment. Subsequently, no advanced skills are needed to apply; as long as you can place the seal onto the rivet gun, point, and shoot, you can install an Avseal. This saves time and removes the worry that a traditional seal might fail simply because of the work involved to place it. Also, Avseals can be removed with a specialized tool and then replaced as needed. If you are unsure whether Avseals are suited for your particular application, a top-notch distributor can help. The best partners will have a range of sizes available for your job, can identify if you have the correct tools for installation, and will offer advice and resources for using this impressive technology.